Taga is a 3-wheel carrier bike that takes only 20 seconds (4 steps) to be transformed into a premium stroller that easily navigates stores, boards trains and slides into elevators. 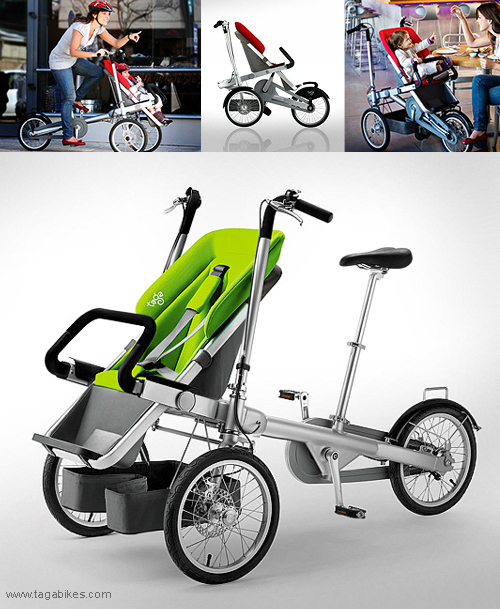 The concept balances stroller features like anodized aluminium and advanced fabrics with state-of-the-art bike technology like disk brakes and high-end gears. Taga accommodates a wide range of accessories like two kids seat, car seat, shopping basket and more thanks to a smart and easy to use universal adapter. The modular design makes it adaptable to changing family needs and can be used from newborns to 6 year-olds. It folds up to fit into almost any car trunk and gives many options for storing at home. Taga design complies with the strictest safety standards for strollers and bicycles. What a creation,It looking very stylish and fabulous,parents will be enjoying riding this,but in opinion parents should buy comfortable ,secure and light stroller for their loving babies.